CareWorks of Ohio Ltd. – An Ohio BWC-certified Managed Care Organization through Ohio’s Health Partnership Program. CareWorks medically manages nearly 30% of all new workers’ compensation claims filed in Ohio. Columbus Downtown Development Corporation – Created in 2002, CDDC is a private, non-profit development organization that is committed to redeveloping and revitalizing downtown Columbus, Ohio. CDDC is led by a Board of Directors comprised of local business and institutional leaders. The Columbus Partnership – Founded in 2002, the Columbus Partnership is a non-profit organization consisting of more than 50 CEOs from Columbus’ leading businesses and institutions. Its primary purpose is to be a thought leader – to strategically consider how to best position Columbus economically for the future. The Partnership is also actively engaged in civic projects related to downtown development, education, leadership development, philanthropy, and arts and culture. 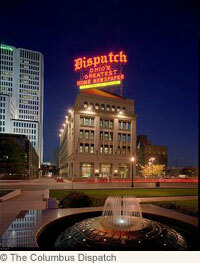 The Dispatch Printing Company – Owner of WTHR Indianapolis (NBC affiliate) and WBNS-TV (Channel 10), WBNS-AM (1460), and WBNS-FM (97.1) in Columbus as well as extensive real estate holdings. Installed Building Products, Inc. – Founded in 1977, Installed Building Products is the nation’s second largest insulation installer for the residential new construction market and a leading installer of complementary building products. Nationwide Children’s Hospital – One of the largest pediatric health care and research centers in the United States. Each year, Nationwide Children’s Hospital delivers care for more than one million patients from around the nation and globe. The Hospital has 68 facilities extending throughout Ohio and beyond. NetJets, Inc. – An affiliate of Berkshire Hathaway, NetJets operates one of the world’s leading fractional aircraft ownership programs with a global fleet of over 700 private jets. NetJets and its affiliates also provide its clients with world-class pilots, aircraft maintenance, and other aircraft support services. The New Albany Company - The New Albany Company is the Wexner family entity developing the Village of New Albany, Ohio, a planned community Northeast of Columbus. Schottenstein Stores Corporation – Founded over 80 years ago, SSC is an established holding company with its roots in retail, wholesale, and manufacturing operations and is among the 250 largest private enterprises in the U.S.
XTO Energy Inc. – Founded in 1986 and a subsidiary of ExxonMobil Corporation since 2010, XTO is the nation’s largest holder of natural gas reserves, and has one of the highest drilling success rates in the industry. XTO holds interest in approximately 40,000 producing oil and natural gas wells across the country. Major Law Firms throughout Ohio - In our role as counsel to legal counsel, we represent major law firms throughout the Ohio in defense of professional liability actions.